I call foul on the AEP comment, does anyone really think it bothers AEP to raise the cost of electricity. Lets break it down like this, say everyone has to buy a Charleston Gazette to survive, and the government comes in and tells the Gazette that it had to switch to a new ink that will increase the production cost by 50%, yet everyone still has to buy a Gazette to survive, so the Gazette increases its sales price by 50%, it really doesn’t change the Gazette’s economics does it. We don’t really have a choice when it comes to electric power do we, we as a consumer can reduce our consumption by adjusting the thermostat, and cutting the lights off, but we still have to buy it to survive, and also have to pay the price they charge. I don’t think AEP is the best source to ask if the increased government regulations are fair. Let’s ask the retired people on fixed income, who now may be choosing between heat or food, you may get a different point of view. Since somewhere around 1/4 of the people on the planet don’t have electricity at all, it seems that hyperbolic generalizations like “we don’t really have a choice when it comes to electric power” are a little off, doesn’t it? In the past 49,800 of 50,000 or so years of modernish human history, we have not had electric power, yet somehow survived. This is not a value statement, just a fact. I haven’t heard anyone advocating abolishing electricity here, yet. Lord only knows. That would require… an interesting argument, at least. But that aside, how many people do you estimate are “choosing between heat or food”? Would you also ask kids who suffer from asthma what they think? Soyedina, I have to agree, maybe I over stated that we need electricity to survive, but having spent some time in the parts of the world that don’t have it and seeing greatly reduced life expectancy for people, you are right we can survive, just not very long, you know technically we don’t need sewage treatment and water treatment facilities either, but I would prefer to live in a place that had them. Ken about the children with asthma, how about this article http://www.agingsociety.org/agingsociety/pdf/asthma.pdf, it suggests asthma was on the decline till the 80’s, I don’t have any proof, but one would have to think outdoor air quality has increased from the 80’s till now. The study suggests the problem is poor indoor air quality from “tight” home construction and children not getting outdoors. The article provides a helpful survey of the available literature on air pollution and impacts on children’s health. So … do you think we should also ask kids about this? “The study starts with the notion that some serious environmental and public health problems related to contaminated water and poor sanitation improve with access to a reliable energy source. And, access to electricity also reduces in-home burning of inefficient and polluting fuels such as coal, wood and animal dung. “… Depending on how electricity is generated, new health hazards can be created, including exposure to particular matter, sulfur oxides, nitrous oxides, volatile organic compounds, and carbon monoxide emitted during power generation. “In this study, researchers used models to examine 40 years of data on infant mortality, life expectancy, electricity use, and coal consumption in 41 countries. They found that electricity use improved infant mortality rates, but only in countries where rates were relatively high in 1965. Also, life expectancy did not appear to be affected by electricity use, but increasing coal consumption was associated with reduced life expectancy and increased infant mortality. I think you’re definitely right that AEP’s crocodile tears about electricity rates are just that — no utility should ever be given credibility on the issue (while retired people on a fixed income most definitely should). But that doesn’t mean AEP has no horse in the race when it comes to regulations affecting coal power. AEP has a lot of old coal-fired plants relative to other utilities on the PJM grid and if the overall price of coal power increases relative to other energy sources, their dirty old plants face a competitive disadvantage. In other words, while AEP is disingenuously couching their concerns about regulations in terms of rate-payers, they actually do have real concerns in terms of how much profit they generate for their shareholders. So it’s more than fair to cry foul on AEP’s statements, but the reality is even fouler than you suggest. About a third of West Virginia households heat their homes with electricity, http://www.census.gov/hhes/www/housing/census/historic/fuels.html … according to the Census Bureau. All true, Ken, and I’m as outraged as any about the fact that Congressional dysfunction and Republican obstructionism are getting in the way of all kinds of crucial programs to support the neediest in our society. But that has nothing to do with coal, and those who suggest it is are being opportunistic in advancing their own agendas. 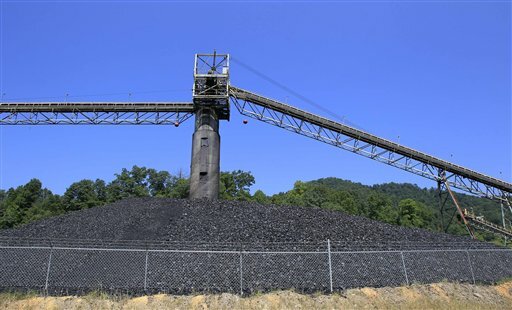 There is plenty of unused natural gas capacity in our region and since it is generally cheaper than Appalachian coal these days, there’s no good argument why using less coal or increasing regulations on coal-based electricity equates to higher electricity prices — it just equates to a smaller share of the electricity market for coal. Isn’t it a bit of a stretch to say this “has nothing to do with coal”? These things are all incredibly connected — global warming, mountaintop removal, affordable and reliable energy (now and into the future), the many external costs of coal (and other forms of power), safety of people who work to provide that energy. These things are all connected … it’s all part of one big picture. Seems to me that folks who try to parse out bits and pieces of it are doing so because those bits and pieces are more of their own personal interest or agenda. See above, for example, how Concerned Miner tries to parse out a bit of a fact sheet on asthma to saw coal-fired power plants aren’t part of the problem … Ken. You may well be right, Ken, though you’re looking at it from a longer-term perspective and my comments were focused on the short term. Certainly we can all agree that if coal, natural gas and other electricity sources all made aggressive moves to clean up their pollution we’d see an increase in electricity rates. But that doesn’t mean residential customers need to see an increase in their bills. As you’ve pointed out many times, ARC estimates that 75,000 jobs could be created making cost-effective energy efficiency investments in Appalachia with the right policies in place. If low and fixed-income residents could take advantage of those programs, then they could well end up with lower electric bills, even if the price of electricity goes up substantially. The biggest fallacy of all, getting back to your issue with parsing out bits and pieces, is equating electricity rates with the size of electricity bills – a smart energy policy would focus on decreasing the latter by enabling cost-effective efficiency improvements, even if overall energy prices went up. Those policies were in place in a number of locations thanks to the stimulus bill, but thanks to obstructionism in Congress, funding for those programs is no longer there. Ans as usual, the most vulnerable in our society pay the price. How do any rate caps in effect in WV play into all this? If you’re not paying market price for electricity because of these caps how can you argue cost increases due to pollution controls when your current price does not actually refect the true cost to produce it? Gosh, if we only had an endless supply of energy that delivered itself to the power plant and didn’t spew toxic residue into the air and water… Or rather, the political will and informed public that would demand the development of such a supply. Gee Vernon, there is plenty of political will out there, the problem is the will of the politicians is not on our side, their best coal buddies see to that. As for an informed public, they believe what is in their own best interest,(pocket book), not the interest or the good of the public as a whole. Even parents who have children with severe asthma or other breathing problems refuse to comprehend the root causes of many of the cases of asthma. It truely is disheartening. If there is such a downturn in coal production, then I think every lump of it goes by my house! I don’t see any let up in the coal traffic around here that is for sure. What counties are seeing a downturn in production? Is there any info on that Ken? There are no “rate caps” in WV. WV law requires that power companies can recover all fuel costs from rate payers. Rising coal prices, not pollution control investments, have caused WV electric rates to rise about 40% over the last five years.